Waste Management is committed to providing reliable collection service. We are also committed to the safety of our drivers and customers. Weather conditions may delay collection times. Please leave containers out until 6:00 PM. We appreciate your understanding and cooperation as we manage weather-related challenges. Waste Management does not provide credit for delayed collection. We will collect up to twice as much material at no extra charge when safe access is possible. There are no weather related service disruptions at this time. To keep containers accessible, please remove snow and extra material from around or on top of them. If your street is snowy or icy, please move your container to a more accessible location to avoid postponed collection. As snow melts, water run-off can result in flooding, which further impedes collection. Please clear storm drains of snow and debris to prevent flooding. If weather conditions prevent collection of garbage or recycling, please remove the containers from the street. Up to twice the regular amount of material will be accepted at no additional charge on the next regular collection day for each container* unless otherwise specified on this weatherboard or by special notification. 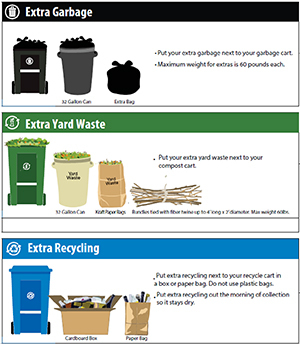 Tips for Managing Extra Garbage & Recycling. There is no limit on the amount of clean recyclables accepted for collection. after Missed Collection: If recycling or yard waste is regularly collected every other week, the uncollected material will be collected on the next regular collection day for that container (two weeks from the missed collection), unless residents are otherwise notified by telephone or on this site. No credit is given for postponed collection due to weather conditions, but up to twice the regular amount is accepted at no extra charge. *Cart colors may vary by area.